Elegant Laser Cut Pomegranate figure on crystal stand, designed by Anat Mayer. The pomegranate in Jewish tradition symbolizes the 613 commandments because there are 613 seeds in a pomegranate. Anat Mayer is one of Israel's premier Judaica artists. 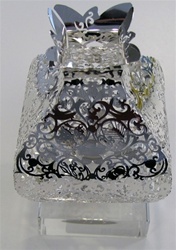 Ideal for wedding gift, anniversary or presentation piece. The piece is 5 3/4" high including the stand.